RT aligns our work with the Universal Declaration of Human Rights, which states that “Education shall be directed to the full development of the human personality and to the strengthening of respect for human rights and fundamental freedoms.” (Article 26.2). Education is at the core of our services, rooted in an English language development framework. Besides helping students improve their English and literacy skills, we create safe and welcoming spaces that honor students’ cultures and build a vibrant community. We invite you to join us as a volunteer in programs such as home-based tutoring, after-school tutoring, and the Women’s Initiative. Home-based tutoring is RT’s oldest program. In this program, trained volunteers make a long-term commitment of weekly tutoring and mentoring in our students' homes. Together, our volunteers and students create lasting, mutually beneficial relationships that break cultural boundaries and transform communities through education. Our home-based tutoring program is designed to develop a sense of welcome, community, and belonging. Volunteers who work with youth, help students develop the English, academic, and social emotional skills needed to succeed at school. They act as caring adult role models. Volunteers who partner with adult students, address the areas the students have identified as the most important: navigating community, pathways to employment and citizenship, etc. Our staff members orient, train, and screen all volunteer applicants; match them with students; and support the matches with ongoing assistance and trainings. We currently run programs at three partner schools in the Bay Area: San Francisco and Oakland International High Schools, as well as Fremont High School (Oakland). We provide academic assistance, as well as socioemotional support/mentoring in safe and supportive environments. At San Francisco International, we have been the lead agency overseeing all academic, enrichment, and recreation activities since the school opened in 2009. We keep our after-school programs culturally and linguistically competent by engaging bilingual/bicultural staff and youth leaders. We also recruit volunteer tutors each semester. Our adult classes are based on curriculum that responds to the needs of our student population. We help students build their English, literacy, life, and job skills (including digital literacy). 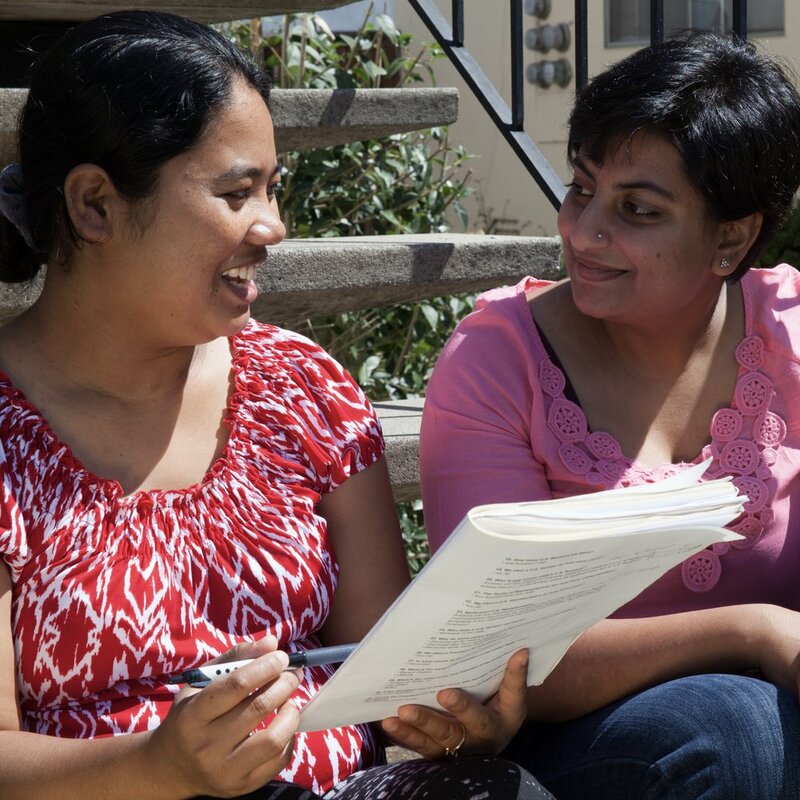 Our class programs include Vocational English and the Women’s Initiative (family literacy). We hire qualified teachers, and assess students using the nationally recognized Comprehensive Adult Student Assessment System (CASAS). Our newcomer community leaders partner with us as interpreters, childcare assistants, and cultural liaisons, ensuring our classes’ cultural and linguistic competency. In addition, we work with classroom volunteers—check out our current opportunities. Our early childhood education program for preschool-aged kids (18 months-5 years old) is part of the Women’s Initiative family literacy program, and runs concurrently with parent classes. We use proven methodologies to foster children’s core developmental skills so that they can be lifelong successful learners. These include interpersonal and social emotional skills, fine and gross motor skills, self-expression, problem-solving, independence, and English. In addition to bolstering the kids’ kindergarten readiness, we assist their parents with enrollment into mainstream pre-k and kindergarten programs. The parent class and early childhood education teachers meet regularly to share topics, vocabulary, activities, etc. to ensure continuity between programs. In the parent classes, we explain activities taking place in early childhood education, so that parents understand the rationale for the activities and can replicate them at home. We explain children’s stages of development and developmental milestones, and demonstrate parent-child activities that are appropriate for each stage. Summer can be a particularly difficult time for newly arrived youth who have sought refuge in the U.S. In addition to the “summer slide, “ i.e., losing some of the academic and English gains they had made over the summer, our students may experience social isolation. Our summer camps provide educational and community-building opportunities that allow students to continue their adjustment to their new country and culture. Youth can practice English, share their culture with others, make lasting friendships, and discover the beauty of the Bay Area.